Volcanos are one of nature's grandest spectacles. Now you can learn all about these terrifying geological features with these challenging flashcards. Shield Volcanoes Built out of layers of lava from repeated ( non- explosive ) eruptions. 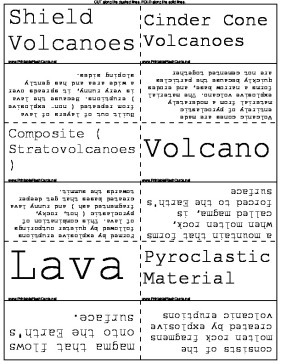 Because the lava is very runny, it spreads over a wide area and has gently sloping sides. Composite ( Stratovolcanoes ) Formed by explosive eruptions followed by quieter outporings of lava. This combination of pyroclastic ( hot, rocky, fragmented ash ) and runny lava created bases that get deeper towards the summit. Lava magma that flows onto the Earth's surface. Magma Deep underground the driving force that creates volcanoes is hot, liquid rock known as magma that collects in chambers. Crater The top, central, funnel shaped vent of a volcano.